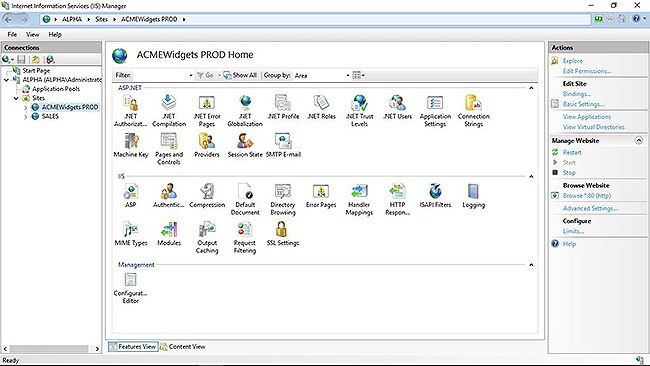 Imagine you’re an administrator at ACME Widgets and it’s time to upgrade your IIS server. You’ll just copy over some folders and point the DNS to the new server and be done right? If you’ve ever done this before you know that isn’t the case. The new IIS server needs to be configured identically to the old one or you’re going to have problems, and you don’t have time for problems. Can’t We Just Move This from One Server to Another? As you stare at the Server Manager on the new machine you plan your next move. 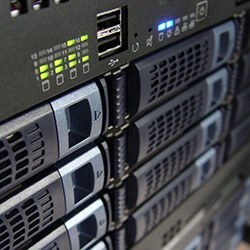 Your old i3 server that’s worked for years has all of your websites and applications on it. The shiny new XEON machine is just waiting to go into service. It has Windows 2016 on it and ready to go. In this article we’re only concerned with the first two parts, which is making sure IIS is installed and configured like it was on the first server. If you copy over the new sites and simply install IIS and fire it up, it…..might work. Unless you have the most basic websites running, it won’t. There are other problems moving from one server to another. What if the operating system is different? It probably will be. Though IIS remarkably good at forward compatibility the UI changes with each release, so if you’re staring at IIS manager to find the settings, it will likely be different. This is certainly one way to figure out what’s installed. In fact I’ve done it a few times this way years ago when I first started out with this stuff. You won’t have to do this, because we’re going to look at a much better way to compare IIS Installations and replicate servers. 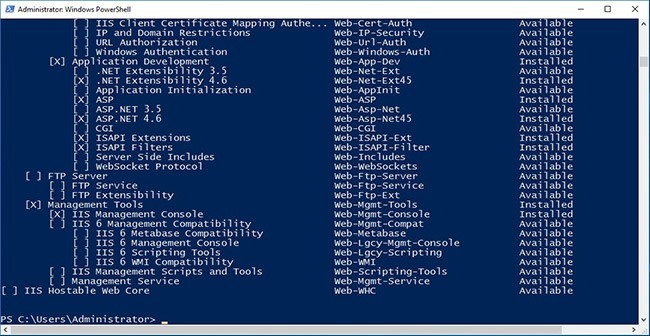 We need to copy the IIS installation configuration from ALPHA which is the existing server to BRAVO which is the new one. By using the pipe and filtering for “where installed” we only show the modules that are currently installed. This is a quick way to spot check what we have installed. When we run this on BRAVO, the new server, we can see that IIS isn’t installed at all. So now we have a clear idea of the IIS Configuration, how it’s setup on ALPHA, and how it’s set up on the new server (not at all). So you can visually see the differences in your old server and your new server with the commands we just ran. Now you just have to remember what’s installed on the first one and carry it over to the new server. But you’ve been really digging into the DevOps thing and keep hearing about making things deterministic. Saying it looks “close enough” won’t cut it, you need to prove it. Here’s a method I’ve come up with that works well for this. We’re going to use one of the oldest methods in the book: the diff. What this does is pipe the output from Get-WindowsFeature to a text file named ALPHA.txt. Then we’ll copy that text file to our workstation. Now we’ll copy that file to our workstation as well. Now you can clearly see the differences in the two configurations and you can prove it, keeping the DevOps gods happy. Now that we know exactly what the differences are in our configuration, we need to set up the new server with those settings so we can move our websites and applications over. Again we’re going to do this in a Devops friendly fashion. You can just install all the items in the diff and be done with the task. But again we want to do this in a deterministic and repeatable way. We want to know for certain it’s the same and be able to do it multiple times. Who knows how many more times you’ll have to change servers or move to the cloud. Wouldn’t you rather have a script to do this for you? So, that’s a lot to Install right? It would be far easier to just build a script to do this, so you can just run it any time you need to set up a server with this configuration. In the the last tutorial we learned how to use DISM to create a repeatable IIS installation but for fun, we’ll do something a little different. So let’s create a PowerShell script. Write-Output "Feature $feature not installed. Installing"
Now as we can see here, we loop through each feature in the list, and say if the feature is not installed, we’ll write out a message saying it isn’t installed, and then install it. If the feature is not installed, we’ll do nothing. This is an example of an idempotent script. This is another key DevOps concept, it means we can run this script over and over and it should do the same thing each time. The expected state (all of these features installed) should be the same no matter how many times we run it. Success! You have now compared the two configurations, determined what you needed to install and scripted it. Now you can take this script and run it on any new server that will host your websites and applications. You’re now once again the hero of the ACME Widgets Information Services department. You had an existing IIS server that was running our websites and applications, and duplicated the configuration to a new server. 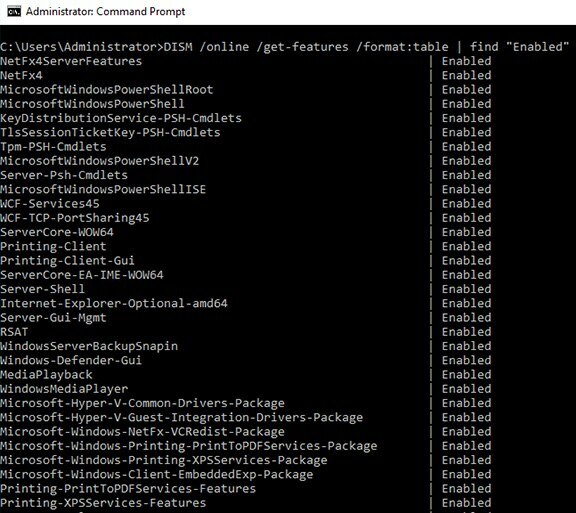 It’s the same concept we covered in the previous article on DISM, only this time we took it a step further by doing a deterministic comparison, then using PowerShell instead of a batch file. This is a more advanced and extendable way. Idempotent - We created a repeatable process that produces the same results every time we do it. This is important stuff, and will take to the next level of Administrator. I cover this topic in detail and many similar operations in my course Installing and Configuring IIS Servers on Pluralsight. It covers many ways you can make your life easier as an Administrator. Questions? Comments? Yell at me on Twitter! Repeatable installs are all the rage in Devops these days. As developers we have this “automate everything” mentality, and for good reason. 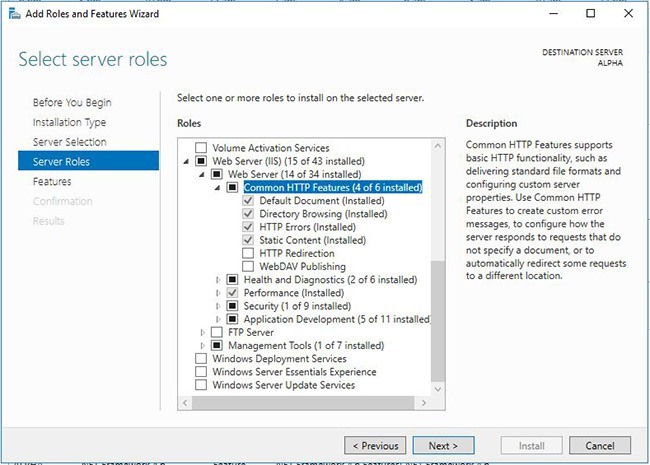 In this article I’ll show you how you can do that with IIS installation as well. There’s no reason to go hunting and pecking around the GUI every time you need to do this. This is the just one of many ways to automate IIS installs, which I’ll be covering in the next few weeks. I also cover this in depth in my latest Pluralsight course on Installing IIS. Why would I ever need to do this? Most of the time administrators probably have a task like “throw IIS on the server and make sure the application works” and they do just that. That’s how I used to do it too. I was working on a project many years ago that required us to spin up VM servers on a virtual network as a “stack”. This stack was a small snapshot of our production network, so to make sure our software worked with everyone’s updates, we had to build a new stack a few times a week. A few times a week, we’d have to click through the GUI install and remember each box to check. Yeah, you can get good at it but it’s a waste of time. Naturally I had to find a way to automate it, and break out some PowerShell. You do this, because you save time that can be spent doing fun stuff. So let’s learn how to create automated, repeatable IIS installations. 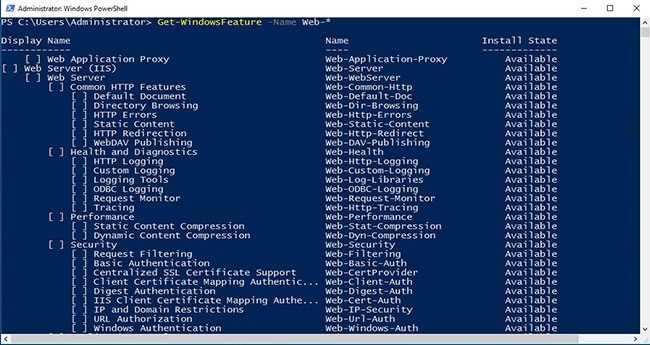 So you’re an administrator for ACME Widgets and you want to create a custom install of IIS and make it automated. You create a new server and are ready to go. 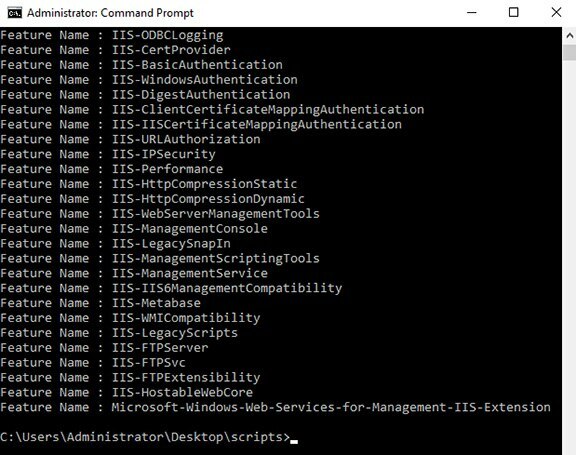 To find out if IIS is installed, we’ll run a command called DISM. DISM is a tool to build and service Windows images, it’s mostly used to create and maintain images for Virtual Machines, it’s extremely powerful, but we’ll cover that in a future article. For now we’ll use it to check features on the machine. As I run it on my virtual machine, I can see that IIS is not yet installed. DISM /online /get-features /format:table | find "Enabled"
by piping the output into find and searching for enabled we can get a full list of features that are already enabled on the server. 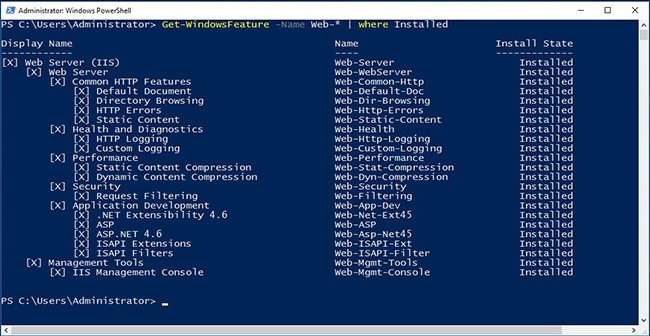 dism /online /get-featureinfo /featurename:IIS-WebServer | find "State"
Here we can quickly and clearly see IIS is not installed. So now that we know we can get this type of output, we’re going to build a little batch file to do it, and we’ll run the command a little different this time. This is pretty light programming, but it will be a set of tests to see if particular items are installed. We’re typing in dism, online, get-featureinfo, featurename, then piping that to find. We’ll look for state saying disabled, and if that phrase is found, that means IIS is disabled, or not installed. That will change our error level, which we’ll add next. echo "IIS Web Server is not installed"
If our error level is set to zero, that means the phrase state enabled was found in our output. Let’s test it out. Now in our batch file we can see that IIS is not installed, and we have a block inside the statement to install IIS. The finished batch file is available here. Check again to see if it’s installed. This small, simple script can make sure IIS is installed on the machine. And it’s repeatable. 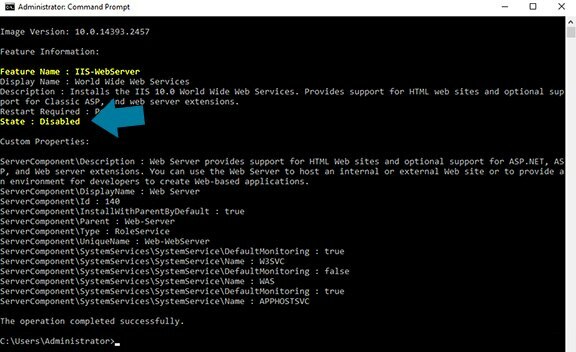 Of course as you’re building your script, you may need to install other IIS modules, chances are it won’t be just a plain IIS install. dism /online /get-features | find "IIS"
echo "ASPNET is not installed. We should install it." echo "HTTP Redirect is not installed . We should install it." echo "HTTP Logging is not installed . We should install it." You get the idea. You can build a custom installation that can be run from a batch file, quickly and easily. So now you’re set to create a neat little batch file you can run on any machine to install IIS to 100 different VMs if you want to. You can put this on an Azure stack, or run it on a development machine. As I stated I cover this and many other repeatable installations in my latest course on Pluralsight. It covers ways to effectively install IIS at a large scale. You can even run DISM remotely or on VM Images that aren’t even booted. It’s a great tool to get to know. In this tutorial, I’ll show you how easy it is to setup file sharing on your network using SAMBA. You can easily share files between Linux and Windows machines with a pretty minimal amount of setup. I’m often asked this question: “hey, you’re a Linux guy right? What Linux should I use? I have this friend who recommends _____ and I want to know what you think?” I usually reply with the same question: what do you want to do? So I decided to make a blog post about it that I can send people instead. Like many geeks of the time I spent the 90s and 2000s with at least 2 or 3 old computers in a closet, connected by a switch running various operating systems with various services running on them. Giant, loud, clunky machines whirring away. I must admit I was surprised when I learned that Microsoft SQL Server would be availble in Linux. They’ve been pushing the open source initiative hard, but I didn’t expect something this big. Oh yeah, Visual Studio is now available for Mac as well. I just saw a pig flying by. While MS-SQL is not open source they have made it available to run on open source platforms such as Linux and OSX, which I can imagine took a ton of work. So I decided to take advantage of this new option and try it out. It works great! It took 5 minutes to install. Here’s how you can do it too. Note that you will need a server with 3.5 gigs of RAM for this.